April 2, 2018 – Courtesy of Snohomish County Conservation District. Our Manure Spreader Program is up and running for 2018! A rental fee of $70 per usage (one week) has been implemented to cover the cost of maintenance and eventual replacement of the manure spreaders. This fee is the same for both the large and small manure spreader. At the beginning of the program a few years back the program was funded by a grant from the Stillaguamish Clean Water District (SCWD). Since that time the grant has completed and the SCWD has been disbanded. With that being the case, the SCD has had to look at other funding sources to keep the program solvent into the future. The way that was decided to do that was to require a rental fee. Determining the rental fee was difficult because there are no commercial rental businesses renting manure spreaders at this time, so a survey was done of other Districts in Washington to determine a rate. Our new rate is the lowest in the state while still providing enough projected funding to assure the proper maintenance and future replacement cost of the manure spreaders. The new fee will be due at drop off or can be paid in advance by calling the office. Donations to the program are also still accepted and appreciated. It was also decided that my time as a farm planner meeting with you all on your property was more valuable than driving the manure spreader across the county, so it was decided to look for a part-time person to deliver and pick up the manure spreaders for 2018. If you are interested in the position or know of someone who is, please watch our website for the job announcement or you may call our main line at (425) 335-5634. After reviewing the latest long-term weather forecasts it looks like our first opportunity for spreading will be in late April. The general rule to applying manure safely is that there be no significant rain for two days prior to application (soil moisture is less than 80%) and limited rain forecasted within 24 hours (<0.10 inches) and 72 hours (<0.50 inches) after application. This rule can vary a little depending on soil type and saturation, but it is a good guideline to follow under most conditions. That is why, in looking at the long-range forecast models currently, we are looking at late April as our first opportunity. Another tool we use to determine whether it is safe to apply manure is the Manure Spreading Advisory map put out by the Whatcom Conservation District for all of Western Washington. You can find it at http://www.whatcomcd.org/msa. This tool is available to everyone and does a great job summarizing all the weather data and soil conditions in the area to determine whether conditions are safe for applying manure. When you look at the map today our whole area is RED…and red means it is the WORST time to apply manure because of runoff and nutrient loss is at a maximum. So, check out this resource, and when you start seeing the red trend toward green, get ready to go! 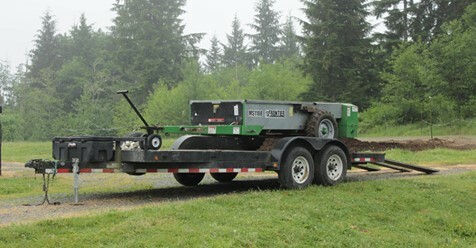 If you would like to check out one of the manure spreaders please either e-mail me or call me at (425) 377-7019 and I will schedule you for the next available slot. We also have available for checkout a lime spreader! Due to our typically acidic soil conditions in Western Washington, one of the common applications to control acidity is lime. To determine if your soil is the right acidity for the grass or crop you are planning to grow just give us a call at 425-335-5634 and we will schedule a time to come out and get a sample of your soil for a FREE soil analysis. If your soil tests too acidic for your grass or crop we will suggest a lime application for you with pounds per acre and other details you will need. For more information on liming your pastures and crops go to the Lime for Pastures and Crops article on the SCD website. Our lime spreader can be pulled by an ATV or a garden tractor/riding lawn mower and is good for small acreage farms. To be put on the list just contact me by e-mail or phone. The same rules apply for the lime spreader as for the manure spreader. If you have any questions about the programs or your place on the list please contact me using my contact information below. Thank you, and I look forward to seeing you all soon! Interested in knowing more about what the Snohomish Conversation can do for you? Click to view their listing in the NW Equine Directory.